It doesn't really matter what your financial goals are. The number one thing that will help you reach them is making sure your spending habits are in check. If you're trying to pay down debt, tightening your purse strings will help you allocate more of your income towards that scary number and away from the impulse purchases that may have gotten you there in the first place. If you're out of debt, but trying to build your net worth, saving money rather than spending it is essential. Building your income is a worthy goal, but all the money in the world won't be enough to make you financially free if you can't keep it in your bank account. 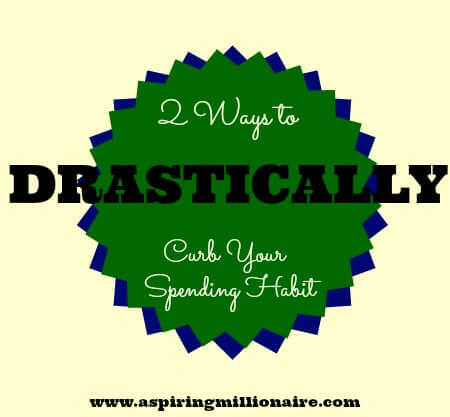 But quitting a spending habit is easier said than done. In order to really accomplish your goals, you have to change the way you think about spending. Let's say you're out shopping and you see the most adorable top that's ever been created. You think, "I have to have this." You flip the price tag over and reveal the number. $75. When you see that $75, I want you to think of it in terms of how much you make an hour. This is easy if you get paid hourly. If you're salaried, take your yearly salary, divide it by forty-eight (which is 12 months a year, four weeks a month,) and then divide that by how many hours you work each week. Use that number as your hourly salary. You can get more exact if you know how many days a year your work, including days off. Let's say you make $30 and hour. You would have to work for two and a half hours just to afford that singular top. Think about two and a half hours in your work day. What does that entail? Odds are, even if you love your job, those two and a half hours of your time are worth far more than another top to add to your closet, which most likely has ample clothing options already in it. Maybe you think that two and a half hours is totally worth that super cute top. If that's the case, take your spending psychology a step further. In our world, money is power. We may not like that fact, but it is the truth. We can lack power by being in debt, or we can empower ourselves by using our money to do positive things. Each dollar is a unit of power, and if we accumulate enough of it, we enable ourselves to do things like go on vacation, retire early, or have enough "power" in our savings account to just walk out on a job if we feel we're being mistreated or under appreciated. So when you see that $75 price tag, ask yourself, "Am I willing to give up 75 units of my power for another shirt? Or are there other areas in my life where I would like to enable myself? If I use 75 units of power here at the mall, in what other area of my life am I sacrificing my power and therefore my freedom?" Have you ever had a spending problem? What are your tips and tricks to get over it? I love the first one - i often think of the things I purchase in terms of how many hours I have to work to buy them. It certainly puts me off a number of impulse buys!! !